1. Rental application must be completed and signed. Note – Single or Combined (take home) income should be 3 times the amount of the property monthly rent. 3. Provide rental references for last 7 years: ~ authorize Landlord contact by clicking HERE. on the front and deliver to Hometown Holdings, LLC – 925 1st ST., SW Roanoke, VA 24016. 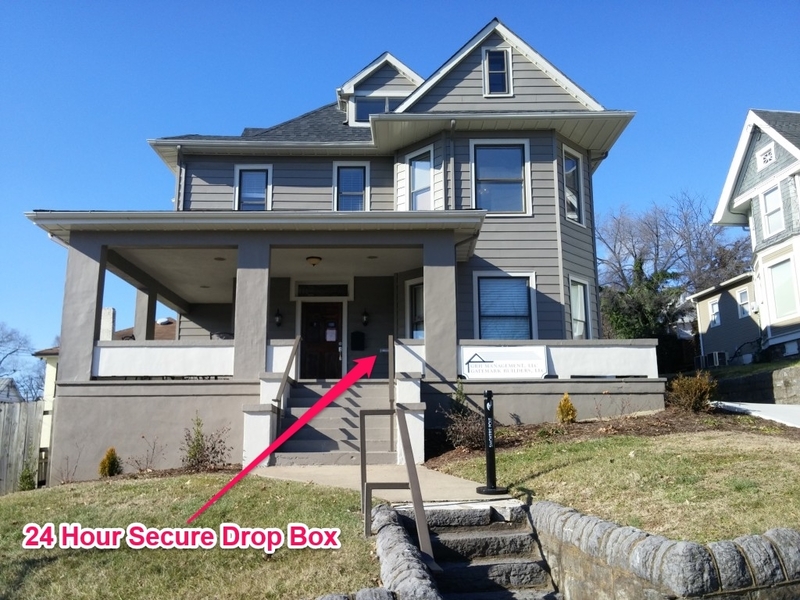 A secured 24 hour drop box is conveniently located to the right of our front door. Other Occupants and Relationship to Applicant/Co-Applicant. Include ages of minor children. Is either co-applicant, or any anticipated occupant a member of the armed services, reserves or National Guard? List the name of the person and branch or service with which the person is a member. Additional regular and current sources of income: SSI, Disability, child support, investments, etc. Has the Applicant or Co-Applicant ever been evicted or asked to move out? Has the Applicant or Co-Applicant ever broken a rental agreement or lease contract? Has the Applicant or Co-Applicant ever been late with rent payments or sued for non-payment of rents? Has the Applicant or Co-Applicant ever been sued for damages to a rental property? Has the Applicant or Co-Applicant ever declared bankruptcy? Has the Applicant or Co-Applicant ever had any judgments against you? Has the Applicant or Co-Applicant ever been convicted of a misdemeanor or a felony, Ex: assault, traffic convictions, offenses related to your pet, or any offense involving the use or abuse of drugs, including alcohol? If yes to any of the above questions, please give the details below including offense charged, offense convicted of, jurisdiction/court in which conviction occurred, date of conviction, and the circumstances upon which conviction was based. I HEREBY CERTIFY THAT THE ABOVE INFORMATION IS TRUE, CORRECT AND COMPLETE; I HEREBY AUTHORIZE LANDLORD OR HIS/HER AGENT TO MAKE, NOW AND DURING ANY TENANCY THAT MAY ENSUE, ANY INQUIRIES/CONTACTS NECESSARY TO EVALUATE/VERIFY THE INFORMATION I HAVE PROVIDED HEREIN, TO INCLUDE INQUIRING WITH THE APPROPRIATE CREDIT CHECKING AUTHORITIES AND/OR JUDICIAL JURISDICTIONS, AND CONTACTING THE REFERENCES WHICH I HAVE LISTED HEREIN. IF I RENT THE IDENTIFIED PREMISES, I UNDERSTAND THAT THE INFORMATION CONTAINED ON THIS FORM AND ON ANY RENTAL AGREEMENT MAY BE MAINTAINED BY LANDLORD FOR UP TO SIX YEARS AFTER I VACATE THE PREMISES, OR AS NEEDED BY LANDLORD TO RECOVER ANY LOSSES ARISING OUT OF SUCH TENANCY. I UNDERSTAND THAT THE LANDLORD MAY AT ANY TIME TERMINATE MY RENTAL AGREEMENT FOR ANY MISREPRESENTATIONS MADE HEREIN.